Maker of stuff: A challenge! Well... part of this years goals are to de junk our lives. Ummm...yeah... that stash... I think I must use it up before buying anything else. Recalling all those times past when I thought "that once I had time on my hands I will make THIS!". I would now have to say "yeah... right!". So we moved to the smaller house last summer. Then there was this Storage Unit... once again... paying for somewhere to keep the junk that we haven't let go of yet. Some was the art studio stuff... now my 'studio room'... is floor to ceiling-wall to wall...STUFF! Very good artsy creative stuff... but stuff! I am going to endeavor to use it all up. No buying anything else (except small items to finish that project I have lost parts to) I am going to use it and stop it from being money that was wasted. I may need to open a etsy store. There is beads, yarn, fabric, leather, glass, baskets, and boxes, and sacks of quilts that never happened.... well...you know the drill. Last night I opened the first box of yarn and started baby blankets to go to my favorite charities. 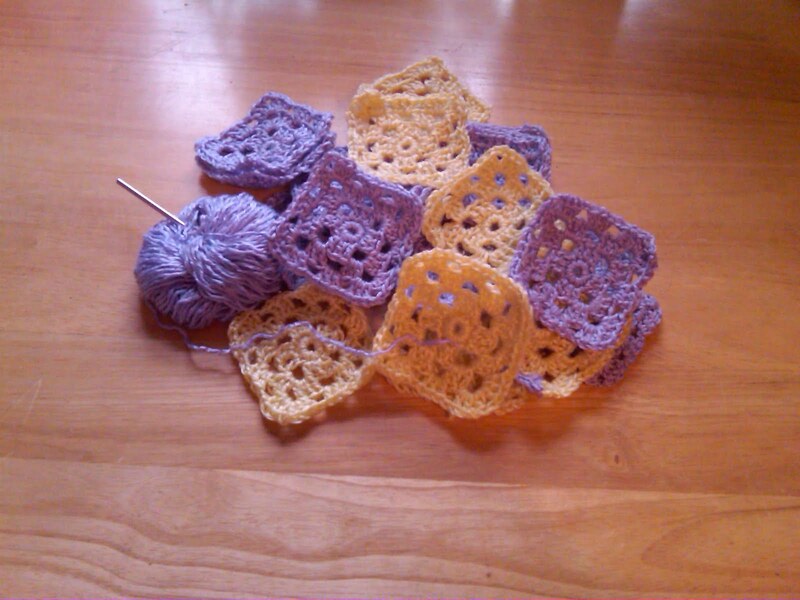 These will be simple granny squares turned into something warm and maybe worth making someone else's memories. I have a picture of the first squares! I suppose that this is going to end up being somewhere between the Anyway Project and something that I have learned from FlyLady.com. Won't promise to buy nothing... just going to do up all these projects before I buy another crafty thing.